"Arrabbiata is Italian for "angry," which refers to the spicy red peppers in this dish. Garnish with grated Romano cheese and fresh parsley, if desired." 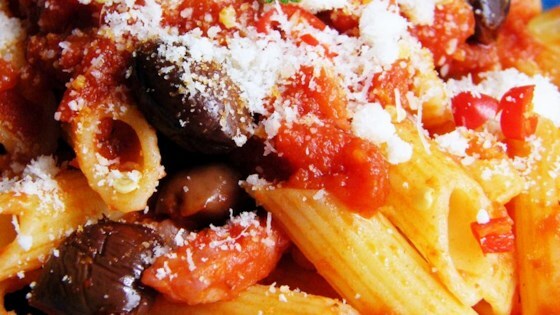 Sure, it may not be an authentic arrabbiata, but boy is this recipe TASTY! I've served it at several dinner parties with rave reviews! I cut down the crushed pepper and eliminated the wine. Very tasty.